Meet the Artist Reception March 2, 2 to 4 p.m.
Implosion of the remains of the original east anchor span pier f The Tappan Zee Bridge. Photographer, historian and author David Rocco will present a pictorial essay of the ongoing construction of the New Tappan Zee / Gov. Cuomo Bridges. As a photographer of the scenic Hudson Valley and beyond, Mr. Rocco has photographed some of the most important and historic restoration projects in the Hudson Valley Region. He is currently known for his stunning photographs documenting the construction and completion of the new Tappan Zee/ Gov. Cuomo Bridge. These photos have been exhibited recently at the Shrub Oak Library in Yorktown, the Warner Library in Tarrytown, and street festivals in Sleepy Hollow and Nyack. In addition to the White Plains Public Library display, exhibitions are also scheduled for this year at a variety of locations, and Mr. Rocco continued his unique photo coverage—on land and by air — by photographing the implosion of the remains of the original east anchor span pier on Tuesday January 15, 2019. A number of Mr. Rocco’s photos that were published in 2016 were considered for a Pulitzer Prize in Photography. A photograph taken by Mr. Rocco in March of 2018 of a trio of tug boats trying to recover two barges that held two separate lengthy steel deck assembled girders sections that floated eight miles down the Hudson River is being considered for a Pulitzer Prize in the photography category of “Local News.” Winning nominations will be announced in April. Over the years, his photo work has been published in a wide variety of noted publications, and his photo images on the “Damage and Destruction of Hurricane Sandy” have been exhibited at the Arts Westchester Gallery in White Plains and The Museum of the City of New York. Some of these photos have been entered into the New York City permanent records. As a self-taught photographer, David Rocco has captured the images of historic restoration projects throughout the Hudson Valley for almost two decades. Since 2013, his prized photos have focused on the New Tappan Zee Bridge, and his vantage points of it are unlike any others. Rocco has travelled aboard helicopters, trains, and boats to capture the new bridge’s construction and the original bridge’s demolition in over 10,000 action and progression shots. The results of his relentless efforts include numerous aerial- photo close-ups of the emerging bridge towers, which topped off at 419 feet, as well as waterfront views of tug boat teams at work throughout the seasons. With a passion for both construction and history, Rocco knows that “once the moment is over, it’s over.” Some of his shots were taken within a few minutes after waiting hours and in some cases, days on location for a specific event. 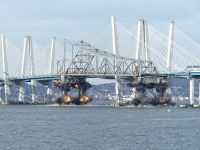 His photos of the overnight removal of the original Tappan Zee Bridge’s truss section, for example, were taken at 3am as the Left Coast Lifter (LCL) (a $50 million floating crane built to assist in the eastern span replacement of the San Francisco – Oakland Bay Bridge before being transported to the TZB project) moved the section across the Hudson Line railroad tracks in November 2017. Mr. Rocco has been a longtime volunteer and organizer of many charitable, cultural, historical and environmental initiatives in the local and regional area. Shortly after retiring from his career as a carpenter with the NYC Housing Authority, he volunteered his time in the recovery efforts for the World Trade Center. He then played a seminal role in the successful development and highly popular Walkway Over the Hudson project, the restoration of the historic Mt. Beacon Fire Tower, the War of 1812 memorial bust project at Lasdon Park, and the creation of the Yorktown Community Dog Park. Mr. Rocco is also a long time volunteer at Westchester County’s SPCA. He has successfully completed the “Fellows” program at the Hudson Valley Patterns for Progress “Think Tank” organization. A consistent blood donor for the past 30 years, he has been organizing blood, bone marrow and organ donor drives at the popular Yorktown Community Street Festival since 2015. A native of both, Yonkers and Mt. Vernon, Mr. Rocco has resided in Yorktown Heights, NY with his wife, Ruby, since 1995. They have three grown children and four grandchildren. The exhibit, which runs to March 22, and the March 2 reception are at the White Plains Public Library, 100 Martine Ave., White Plains.